Make Your Own Wind Chimes with Beads! I've written about all sorts of home decor ideas using beads and findings before (see links below). If you have a veranda, balcony or some outdoor space, you might want to make some wonderful wind chimes with beads! Soft tinkling sounds and pretty crystals to reflect the light will make the warmer weather sparkle! I spotted this inspirational design made by Jude Wroblewski over on Fire Mountain Gems. I didn't know until then that one could actually buy just the anodized aluminum chimes (no longer available. They come in different colors. So making your own custom designs is possible! This sort of project is also ideal for using up odd beads, broken or unwanted jewelry items. 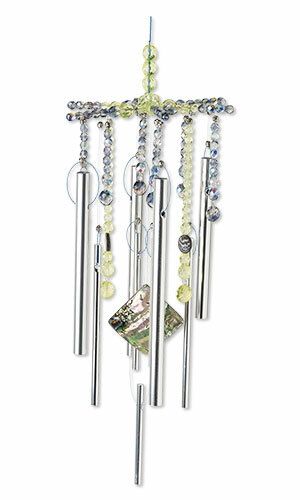 I love windchimes and have often thought of making my own. This is certainly an incentive to do just that! Oh wow! I didn't know that you could purchase the chimes either. I will have to pick some up. I just love windchimes. Wind chimes have been on my list forever - one day I will make some, they are a really good stash buster!